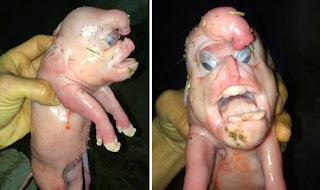 A mother pig in China's Guangxi Zhuang region gave birth to 19 piglets, the 19th one was a bizarre looking one having its face looking similar to human Soon after the birth the mother pig refused to feed the little one and it died few hours later. This is considered to be a mutation problem, the other 18 piglet are fine and healthy. Tao Lu, the owner of the farm where this event occurred said lot's of people visited the bizarre looking piglet and even offered money to buy the mutant animal. Unfortunately, possibly due to this rare and extreme mutation the mutant piglet could not survive long and passed away shortly after being born.